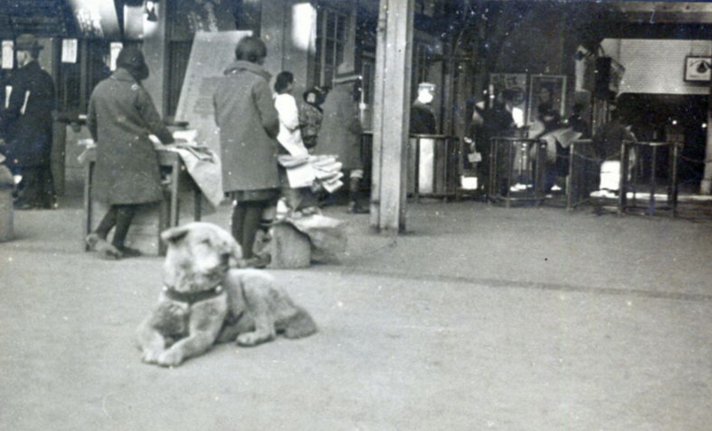 A rare 80-year-old photo of Hachiko, the dog whose amazing loyalty inspired the film “Hachi: A Dog’s Tale,” surfaced this week. The Japan News shared the photo of the legendary Akita at Tokyo’s Shibuya Station, where he waited for his owner, Hidesaburo Ueno, to come home from work every day. Even after Ueno died, Hachiko waited 10 years in the same spot. The dog became a fixture of the station and a local hero, especially after he was profiled in a series of articles. The photo is thought to be form 1934 and was taken by the late Isamu Yamamoto, a former bank employee who lived in the Sarugakucho district in Tokyo, according to The Japan News. That’s the same year that the first statue of Hachiko was erected in front of the station. Yamamoto’s family found the photo when they were cleaning up the house where he lived and gave it to sculptor Takeshi Ando, 92, who created the second statue in front of the station (the first was created by his father, Teru). Hachiko’s inspirational devotion was first told in the 1987 Japanese film “Hachi-kō.” The 2009 American remake (which will have any dog lover in tears) was directed by Lasse Hallström and starred Richard Gere, Joan Allen and Jason Alexander, with the setting moved to Rhode Island. ← ‘Finding Dory’ Trailer: Can the Forgetful Fish Find Her Family?